Pierre-Emerick Aubameyang looks set for a move to Arsenal. ARSENAL ARE ON the verge of signing Pierre-Emerick Aubameyang from Borussia Dortmund after the clubs agreed a £60 million (€68 million) fee in principle for the Gabon international, according to reports. 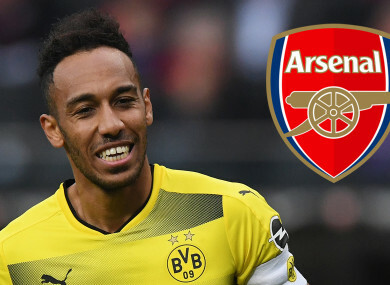 Aubameyang, 28, has been subject of negotiations between the Gunners and Dortmund for several weeks, with Arsenal refusing to meet the Bundesliga side’s £70m asking price. The striker, who scored 31 league goals last season, was left out of two consecutive games for Dortmund after missing a team meeting, with head coach Peter Stoger accusing the frontman of not being focused. However, Aubameyang started in Dortmund’s draw with Freiburg on Saturday amid claims from the Bundesliga side that a transfer would be sanctioned if Arsenal reached ‘certain parameters’. We are ready to realise a transfer under certain parameters, but only if these are fully met,” sporting director Michael Zorc told German TV. Aubameyang would join up with former Dortmund team-mate Henrikh Mkhitaryan at Arsenal after the Armenian joined the club in a swap deal which saw Alexis Sanchez head to Manchester United. The duo combined for 62 goals in all competitions two seasons ago. This season, Aubameyang has scored 21 goals in 24 matches in all competitions. He has found the net 141 times since joining BVB from Saint-Etienne for €13m in July 2013, and he also has 23 goals in 56 caps for Gabon. He’s on the verge of joining an Arsenal side sitting sixth in the Premier League table, five points out of the top four. The Gunners were eliminated in their opening FA Cup fixture against Nottingham Forest earlier this month but have advanced to next month’s Carabao Cup final against Manchester City and will face Swedish side Ostersund in the Europa League last-32. As previously reported, West Brom defender Jonny Evans is also a target at the Emirates Stadium, although a hamstring injury sustained at the weekend could see a transfer put on hold until the summer. Evans is open to a move, but Arsenal may face a late battle, with the likes of Liverpool and Manchester City keen to land the ex-Manchester United player depending on his fitness status. Email “Arsenal close in on £60m signing of Dortmund star - reports”. Feedback on “Arsenal close in on £60m signing of Dortmund star - reports”.